I was excited when a package from Wall Candy Arts arrived at my door! 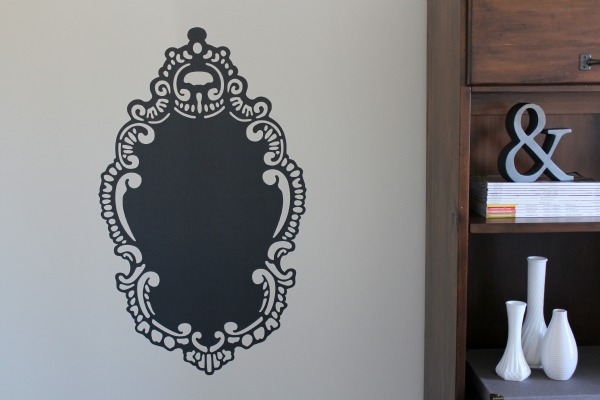 I’ve had my eye on their rococo chalkboard decal for a while now, thinking it would be a fun and functional addition to my office. A couple years ago, I painted my office Benjamin Moore’s Creamy White to keep it light and airy. The plan was to add drapery, artwork, and accessories to liven up an otherwise neutral palette of white, cream, grey and espresso. To tell you the truth, after working in my office for a while, I really didn’t miss color per se, so I decided to keep it monochromatic until my feelings changed. However, I always felt like I needed to add some character, and the rococo chalkboard seemed like it would do just that. 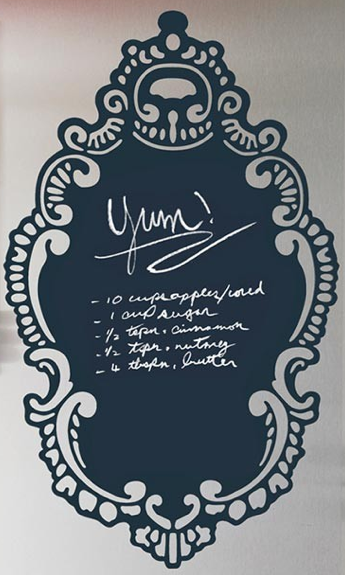 This chalkboard decal is so simple to install that I literally had it up in less than 5 minutes. Peeling it from the backing it came on required a little patience to make sure it didn’t tear or stretch given the intricate detailing of the rococo design, but repositioning it on the wall to get it just right was remarkably effortless. Erasing and creating a new message was no problem at all. However, I think I’ll stick to inspirational quotes since “To Do” lists can get overwhelming, right? I can see how easy it would be to move the chalkboard to another area if I ever wanted to change it up. I think it would be fantastic in the kitchen, mudroom, a girl’s bedroom- pretty much anywhere! 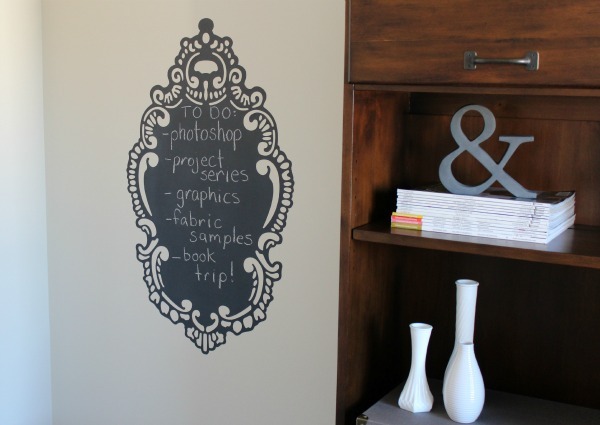 Wall Candy Arts creates a full line-up of removable wallpaper, dry erase decals, and chalkboards in other designs. I love that they’re non-toxic, especially important when installing in kids’ rooms. 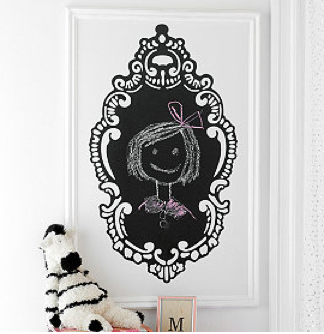 Disclosure: Wall Candy Arts sent me the rococo chalkboard to try. All opinions are genuine and my own- as always! Yes, definitely feeling the need for one of those! I love that Shauna! I sold Wall Candy when I had a store in Ontario and loved their products. Great company to affiliate yourself with. Oohh, my daughter would love the Rococo decal.. Going over to check it out! I’m a new follower by the way and I think your blog rocks! How fun! I love the style of it, but still keeping it simple and monochromatic! Lovely! Wow this is so neat. This would work great in my office as well. Off to go check product out.